This month our featured 'Real Wedding' is Rachel Stephenson, who married her fiancé in July at Bishop Eton, followed by a reception at Double Tree Hotel Liverpool. Rachel had a gorgeous rustic theme wedding and wanted an orange and blue hand-tied bouquet. She wanted flowers for herself, her Groom, Bridesmaid, Flower Girl, Buttonholes, Corsages and matching flowers at the Hotel. 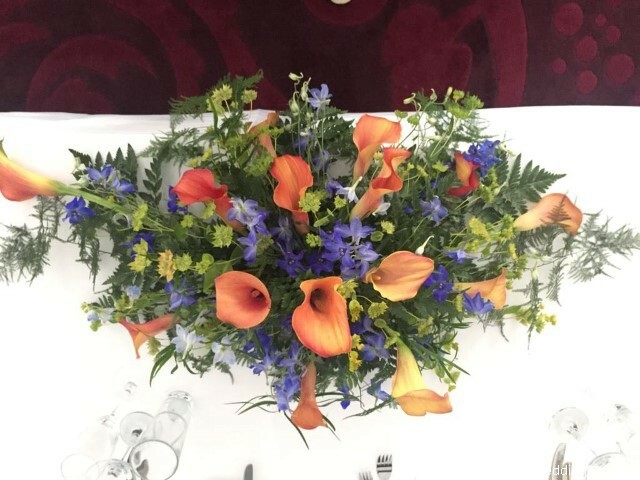 After a wedding consultation with us, she decided her bouquet would have beautiful orange calla lilies, blue delphiniums and bupleurum. For the Hotel she selected matching flowers in a lovely top table arrangement and glass jars on mirror plates to decorate the other tables. Her Bridesmaid had a similar smaller hand-tied bouquet containing the same flowers, while the Flower Girl had a calla lily wand and the Groom had a striking calla lily buttonhole. 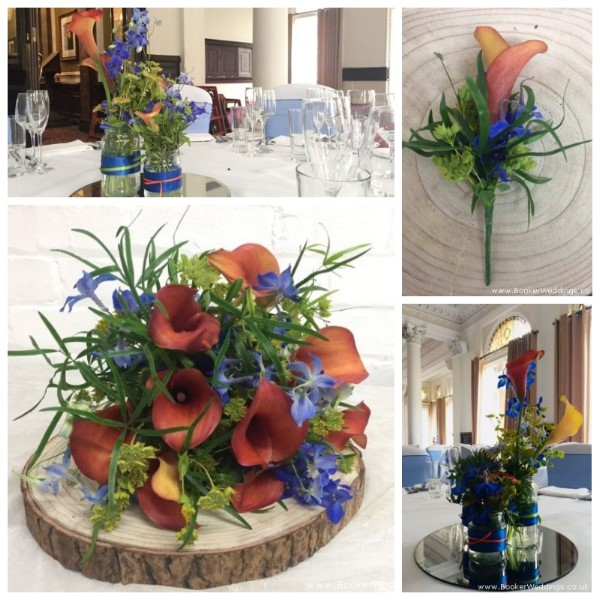 We think you will agree these flowers together with the colour combination looked stunning! To see more photos of Rachel's gorgeous flowers, check out her Wedding Flowers gallery. All the pictures on our website are from real Weddings, so if you want some further inspiration or would like to read our Bride's testimonials (like Rachel's below) then check out our Liverpool Wedding Florists website.